In front of me is a World of White. 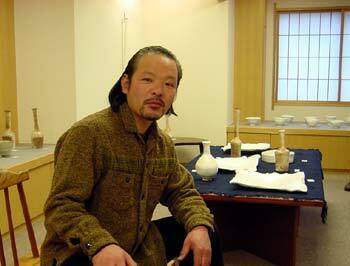 This is the glamorous world of Kato Tsubusa, a potter devoted to white porcelain clay. When one rivets the eyes on Kato's shapes, which look pure at a glance, they will be drawn into the smooth white porcelain skin, into the sensual curvy lines that cannot be created by calculation, and into the delicate color tone weaved by the glazes. It is almost as if the works were beckoning saying "Come on, come here." 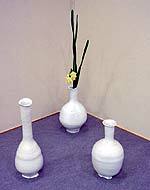 Most porcelain is fired in a gas-fired kiln; the works presented at this exhibition were fired in Kato's wood-fired kiln at Kawakomaki in Kamo-gun, Gifu. That is why the word "Kawakomaki" is in the name of all the pieces. 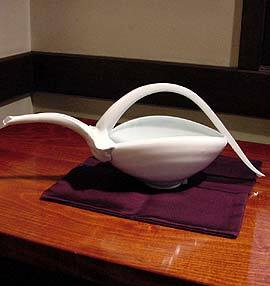 Q: Although it is generally called "white porcelain," there are varieties of white such as snow white, bluish white, ivory, etc. How do you create the variations? A. It is not what I create, rather variations come out like this because of the use of the wood-fired kiln. Every piece gets fired evenly in a gas-fired kiln, but in a wood-fired kiln some pieces are fired a lot while others are not. Flames and winds always vary. Plus all the burned ash, sand, and dust stick to pieces. Those accidents create subtle changes on the pieces. Where the flame is full of life, glaze rolls on the piece swiftly, while the pieces turn out dull where there is not much flame. It depends how the flame runs.  Q: The white surface sometimes turns yellowish or transparent cobalt blue. Is it the glaze? A. Yes. I use a transparent glaze. 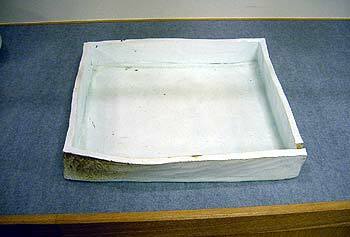 But ash falls in a wood-fired kiln, and the glaze gets mixed with the ash. As a result, it turns bluish, greenish, or yellowish. Also, this blue is different from the blue white porcelain fired accurately in a gas-fired kiln. 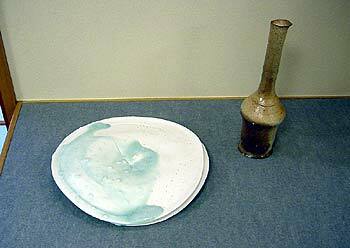 I use exactly the same transparent glaze, but the color results vary by the way they are fired. Kawakomaki White Porcelain Katakuchi; please see the beautiful blue in its depth. Bluish White Porcelain Choshi. 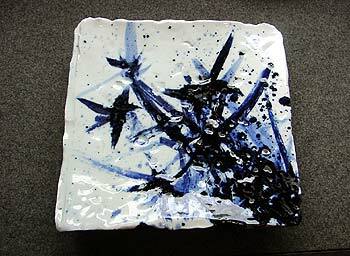 This piece was fired in a gas-fired kiln. Please compare its color tone with the one fired in a wood-fired kiln. 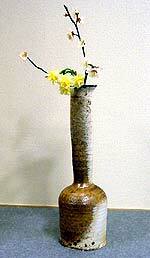 Q: Do you use clay from Amakusa for your porcelain like Arita-yaki? A. My clay comes from New Zealand. The principal ingredient is New Zealand kaolin, and some other elements are added in order to make it sticky. Because New Zealand clay is used for industrial products, there are many factories processing the clay in Tajimi, Toki, and Mizunami where I am from. I buy a ton or two of the clay and use it after mixing it using a clay mixer. Q: How easy is it to handle? A. There are certain kinds of clay that are easy to handle while some are hard to handle. But the clay from New Zealand is difficult to shape, extremely difficult. It hardly grows taller when it is turned on a wheel. If one who is not used to the clay he uses, he gets surprised. I was very shocked by it too. About 20 years ago I used to deal with stoneware, like red clay, and was not working with porcelain clay. However, one day I came across upon this porcelain clay and have since become devoted to it. Q: What made you want to work with clay that was so hard to handle? A. I was confident of my technique on a wheel, but it was totally destroyed. (laughs) It was so hard to handle that I was about to give up. But if I had given up, I would have felt like I lost to myself. In addition to that, the clay was so amazingly white and that attracted me. 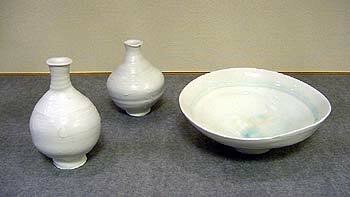 Porcelain clay from Amakusa is ivory-toned, but the clay from New Zealand is snow white. Q: You are famous for snow white objects. They are very delicate and complicated in shape. I wonder how you made such things using that difficult clay. A. (laughs) Yes, they came after many trials and errors. I had not planned to make those shapes, but when I was creating something and focusing on bringing out the porcelain clay's smoothness and glamour, it turned out to be those shapes. Q: I see some stoneware works besides white porcelain pieces at this exhibition. A. The clay was from a mountain in Tajimi, my hometown and also from construction sites. A. When they scrape a mountain to cut a road, the clay is left at the exposed areas. When the workers are off, like Sundays, I cross over the fence, dig some clay up, and put it in a bag. Q: Oh, the feeling of a pottery center is like that? A. Yes, just like that. (laughs) There are stopes for clay to make industrial products, but a layer of sticky clay happens to come out. The color and stickiness vary depending on the layer of earth. Seeing the different characteristics of clay is interesting. In some cases, without digging deeply, the surface of a mountain reveals sticky clay. The mountain itself is a sticky clay mountain. Q: I heard you were born in Tajimi City. Is your family in a pottery related business? A. Yes. I grew up in such circumstances. Some relatives of mine had a pottery factory. So my parents helped them and I had many opportunities to deal with clay. I think my grandfather influenced me a lot, too. He was not a potter, but he made figurines of alligators or tigers. When I was a child, I made a monster and something else just like playing with a toy. You know, children play with blocks at nursery school. The clay was always around me just like that. I was not especially trained to be a potter when I was little. Q: So when did you make up your mind to be a potter? A. Well, it was when I was in middle school, I think. I hated school, anyway. (laughs) I rather liked to go to a mountain and dig a hole to make a fort. Q: Clay is almost like a part of your body, then. A. Yeah, it is. I'm addicted to clay. I am almost addicted to sticky clay. (laughs) When I don't touch clay for a while, I begin missing it. And when I make something of clay after a while, I feel myself again. I assume all potters will agree with me. Clay is everything. Q: You studied at Tajimi City Ceramic Design Institute, didn't you? A. Yes. Now it has became so popular among young people that it is hard to get in. The institute was established originally to train young people to support local industries, not to train potters. Therefore, in my time we were not allowed to work on the wheel much. It rather focused on "design," the training of "creating an image for molding," such as creating a plaster mold as a prototype for mass production. Q: But what you learned there was beneficial? A. It was absolutely beneficial. It helped me a lot because I was introduced to information of not only designs of chawan and plates that were everywhere in Tajimi, but also designs of ceramics and furniture from all over the world. If I had only seen Tajimi, I would only know typical designs like a karako pattern (Chinese motif of children) on chawan, for instance. I could have been a person who does not know much of the world, but I was exposed to designs from New York or Italy. It was pretty shocking. Q: Your work's somewhat contemporary atmosphere might come from that influence. Did you have a job of drawing on pottery at a local kiln temporary after that? A. Yes. I got a job at a kiln. I was only allowed to mix clay in a clay mixer, or to attach a handle to the body of a coffee cup made using a mold. The person next to me was skillful and drew on a pot in such a cool manner. I was jealous! (laughs) but I was attaching a handle one after another and another. I became fed up with the sequency. While I was thinking I did not come to do such job, I did my best. I wanted to earn pocket money, so it could not be helped. One day, one of the drawing people left, and they were looking for a young person to replace him. Q: "I'll do it!," you said? A. It was not such a big thing to ask for -- five workers, four girls and I, were going to be tested how well we could draw. The theme was a weed - having a stem standing straight with small dot-like red flowers on top with a thin long leave, called mizuhiki, which was often used as a flower for the Japanese tea ceremony. The result was that I was the worst (laughs), but they chose me for my vigorous brushstrokes. I drew with full energy. It is important to be vigorous when one draws on an unglazed pot. A. Yes, but I was drawing mizuhiki day after day and got tired of it. Yet, I was allowed to draw some other patterns too little by little. But, until I finally left there, I was told that I was such a dub. For example, the chicks I drew on coffee cups. Those chicks had to be drawn precisely the same, but each of them varied in my case, some elongated and some chubby. No stability at all. Q: You don't like to do what you are told to? A. No, I don't. There was a design just with dots, but it was too much of a bother for me to draw dots. When I had to draw six dots evenly by the yunomi's lip edge, I just drew five. (laughs) But no one noticed. When I visited the kiln a while after I had left, the rest of people were drawing five dots, too. A. Even after that, I made 500 yunomi and then 1000 yunomi on a wheel as a part-time job. Through the experience, I was trained by the local industry. I can not make stuff like standard products now, but I know that my skill is based on the experience. Q: So your unconventional work was born on that firmly established foundation. What kind of work would you like to make in future? A. I would like to work both on porcelain and stoneware, but especially more and more doing various designs with porcelain.